Thanks so much for all of the nice comments and feedback on our gradual garage upgrade. I didn’t even to get into the other benefits of the new doors the other day. Until we got the new doors we only had one automatic opener, which Mr. Much More Patient graciously let me use. That meant that he had to manually open his door. That’s not the end of the world, but in the middle of winter I can imagine it wasn’t a lot of fun to park the car, get out and open the door. And he never closed the door in the morning when he left (I wouldn’t have either, to be fair). The finished garage, complete with new doors. I actually got him a garage door opener for his birthday one year. Well, I tried to. I did one of those certificates to which he said, “I don’t need that,” and it never happened. A broken cable on one of the doors is actually what instigated pulling the trigger on new garage doors now. The garage door guy fixed the cable for no charge at the same time he gave us a quote on doors and new openers. 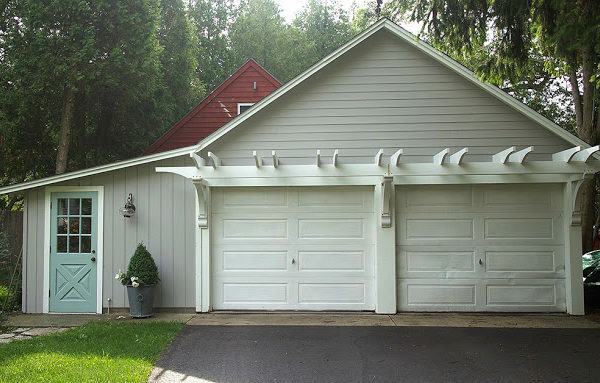 So it turns out that garage doors, particularly nice ones, are not inexpensive. It’s one of those things that you have no idea what they cost until you need them. The first quote we got was for pretty basic doors, but I only wanted to replace the doors if we could afford carriage-style doors. The quote we got was for Clopay doors, which I quickly discovered is pretty much the major manufacturer of garage doors. 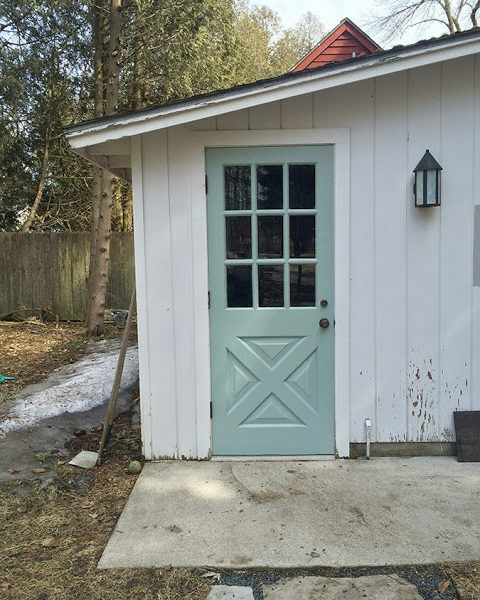 Upgrading to a carriage-style door, even one that wasn’t as well insulated as the more basic doors we had originally been quoted, bumped the price for two doors up by almost $1,000 doors. Ouch. One thing I learned is that garage doors are definitely something to shop around a bit for. I used a local independent garage door installer and his price was significantly lower than the same doors installed from Home Depot and another larger company. These are the three window options we chose from, drawn up on the visualizer tool on Clopay’s website. We ended up going with the first option. Once I knew we were going for the carriage style doors, I used the garage door builder tool on Clopay’s website to play around with the options. This is something I often do myself with my crude Photoshop skills, so I was pretty happy to be able to easily do it. When I decided how many panels I wanted and what style (I liked vertical panels over an X-shape design), I could swap out various window styles. 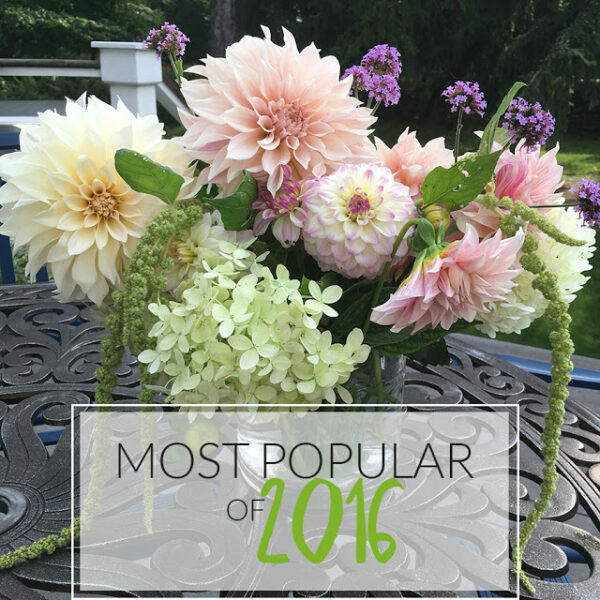 You might have caught this exercise on the Facebook page where I asked people to weigh in on what they liked best. There was no consensus so I took that to mean I couldn’t go wrong regardless of what I chose. We got doors from the Grand Harbor line. I liked the window options better in the next line up (the Coachman), but the price difference was huge. Since our garage is unheated, we had the luxury of being able to save a few bucks with uninsulated doors. The trim on the doors that give them the carriage door look are composite on top of steel. All the pretty stuff is great, but the openers (Liftmaster) are fantastic too. I actually didn’t realize that it was possible to open a garage door without it screeching and shuddering on the way up. And the remotes work from far enough away that we can open the doors from the house if we’re so inclined. There was one little hitch that I had a feeling would happen. 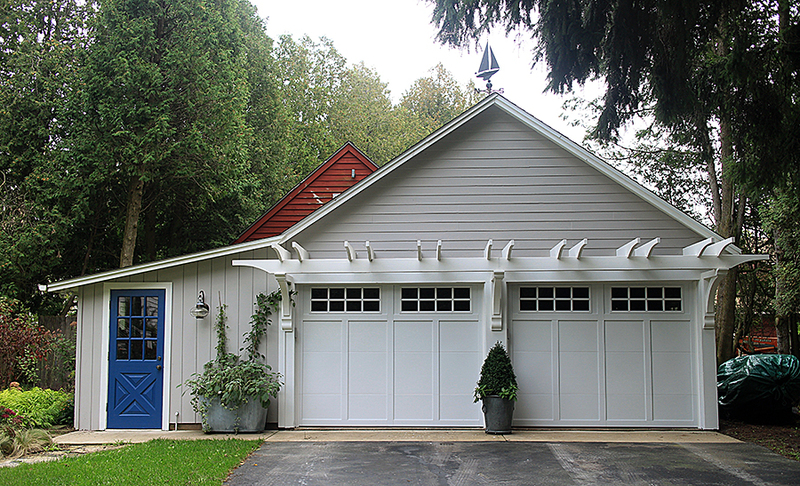 Clopay’s standard white color was a bit grayer than the white trim paint we had on the garage. The trim paint was a poor match to Ben Moore’s Simply White and it was definitely on the yellow side. Fortunately Sherwin-Williams stores can match Clopay’s paint colors, so I picked up a gallon and did one quick coat on the trim around the doors to make the color match better and now my overly fussy eye for whites is satisfied. I can’t tell you how fun it is to push that button every day! Note: Just to be clear, we bought the doors ourselves and received no compensation from Clopay for this post. I just wanted to share our experience with you guys. I really like your new doors. I can remember when we got a new door. It was transforming. Hitting that button when you come home from work on a cold snowy day and that door lifts sure makes one grateful. The doors look great. How did you do the woodwork above the doors? That's the finishing touch! What color blue did you use on your door?